Wide, fast, sweeping roads, with nerves of steel required to move across lanes to make turns; unpleasant places to ride a bicycle. Gyratory removal is unsurprisingly very popular with cyclists, and is starting to happen across London. The one-way system around Piccadilly was restored to two-way working recently (with, in my opinion, mixed results for cycling), and there are plans afoot to remove the Aldgate gyratory [pdf], among others. making bike journeys easier and more direct by removing one-way streets, gyratories and complicated crossings of big roads. Well, I’m not quite so sure gryatories and one-way systems are such a bad thing (bear with me). I think that in many places we actually need them, and that they can be highly beneficial for cycling, and for public transport. 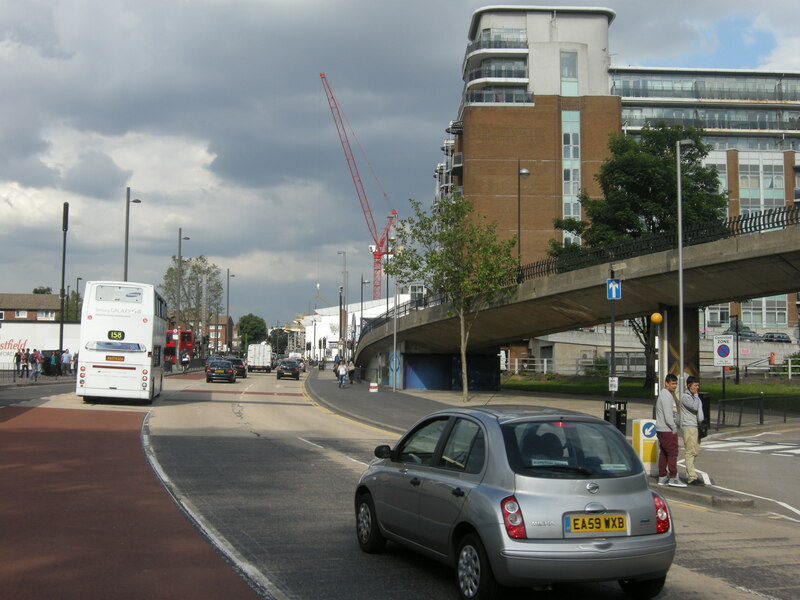 We will put Dutch-style segregated lanes on several one-way streets where the bus stops are only on one side of the road, such as part of Harleyford Road in Vauxhall. The broader point, hinted at here, is that segregrated tracks, running in both directions, are more possible on one-way roads. Keeping roads one-way for motor vehicles only allows space to be allocated specifically for cycling. By contrast, restoring current one-way systems and gyratories to two-way movement for motor vehicles would clearly impinge on the amount of space that can be given over to bus lanes and cycle tracks. So – if we are serious about prioritising bicycle use in London and other cities across Britain, I think gyratories and one-way systems (of a particular form) should be here to stay, and indeed should actually be introduced in some places where they don’t currently exist. 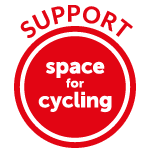 According to the Vision for Cycling document, Transport for London are sacrificing their commitment to a comfortable cycling experience where bus lanes currently exist. There is not the space between buildings for cycle tracks, and for keeping bus lanes, and for keeping two-way motor vehicle flow. The answer in some places would be to create one-way systems, for motor vehicles only; to reallocate the space used for two-way running to bicycle tracks, while keeping bus lanes. I’ll come to some Dutch examples of this kind of design in a moment, but first we can take a look at Piccadilly, which is an interesting example of how this might have worked. 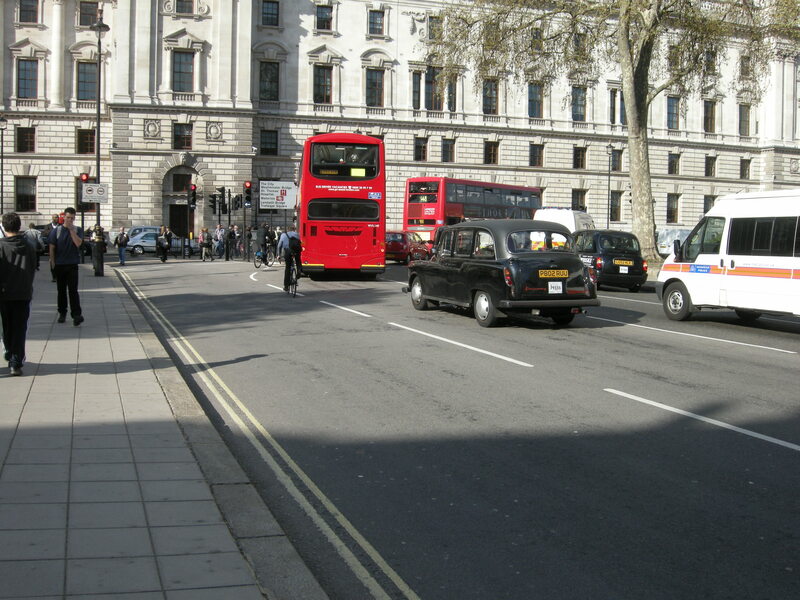 Here’s the old arrangement, looking west from close to the Royal Academy. A bus lane in each direction, with three motor vehicle lanes heading east. If you were driving on this street, and you wanted to get to Hyde Park Corner, you would actually be substantially disadvantaged, having to progress all the way around a giant rectangle formed by Haymarket and Pall Mall. Now you can drive west (heading away from us). The bus lane going west has disappeared, as have a good number of the eastbound vehicle lanes, to make way for a westbound carriageway. Instead of three lanes heading east, we now have one or two in each direction. Eastbound capacity for private motor vehicles has been sacrificed. My point is that, ideally, this eastbound capacity reduction should have occurred without the introduction of a westbound carriageway; that space instead could have been allocated to cycle tracks running in both directions. In so doing you would have made driving in central London as difficult as it was before (and not slightly easier), and you would also have made cycling along this road a more comfortable and pleasant experience (instead of having to fight your way through motor traffic, particularly heading east). In short, the one-way system for motor vehicles should have been kept, and the space used to create two-way motor vehicle movements should instead have been allocated to cycling. Precisely the same is true at other horrible gyratories across London. I don’t want to see two-way roads for motor vehicles all around King’s Cross, because that would use up valuable space, and valuable signal time, that could be allocated instead to cycling and public transport. Keep the gyratory for motor vehicles; make them continue to go around the houses, so that their journeys are inconvenient. This can be achieved while making bicycle journeys comfortable, direct and straightforward (indeed, keeping one-way running for cars makes this even easier). One-way systems are a significant feature of Dutch towns and cities, and they go a long way towards explaining why they are so pleasant to cycle around. They make driving inconvenient by comparison with cycling, and they also allow space between buildings to be used for public transport, walking and cycling instead, in ways that would not be possible with two-way flow for motor vehicles. A simple example to start with. 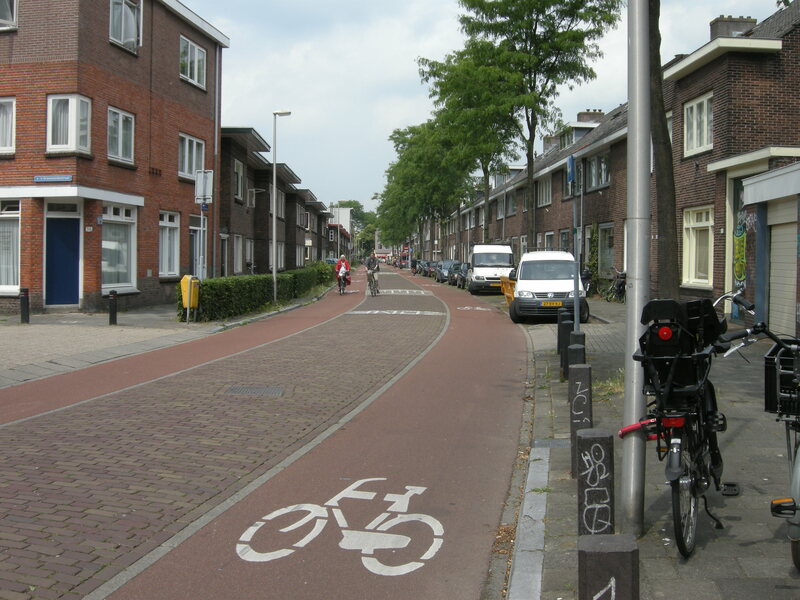 This street is part of a complex one-way system in a residential area just to the north-east of Utrecht city centre. One-way for cars (towards us) but, as you can see, two-way for bicycles. This street would be substantially worse for cycling if it was two-way for motor vehicles. The one-way system has the additional advantage of discouraging driving through this area, and you can see that it works. Not much driving. It even seems to have made the Google Streetview drivers quit in disgust, as this area is barely mapped at all. Elsewhere in Utrecht, there exist ‘virtual’ one-way systems, that only exist for motor vehicles, but not for bicycles or public transport. Try driving into the centre from the east – you will be forced to take an extensive detour. 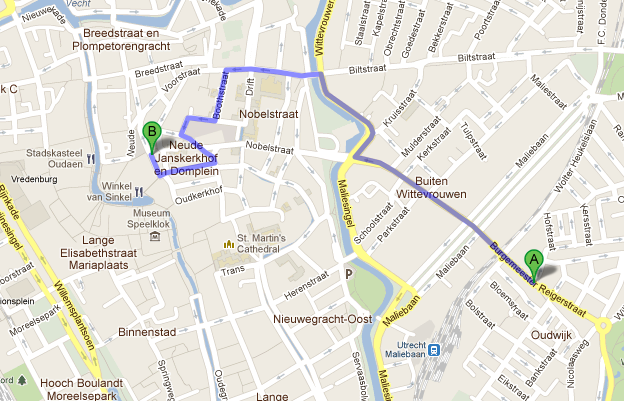 This is because a section of this route, Nobelstraat, is part of a ‘gyratory’; a one-way road for cars, but in the opposite direction. Looking west. A two-way bus lane in the middle, and a cycle track on the right. No way through for motor vehicles; only a one-way road towards us on the left. 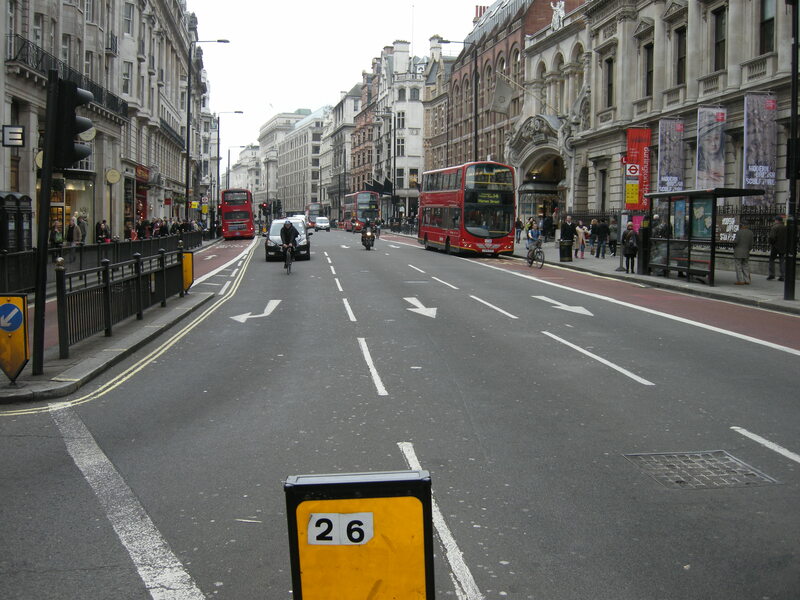 This is what big one-way streets in London could begin to look like if we decided not to dismantle them entirely, but to keep one-way running for motor vehicles, and use the space we might have allocated to two-way flow specifically for public transport, walking and cycling. 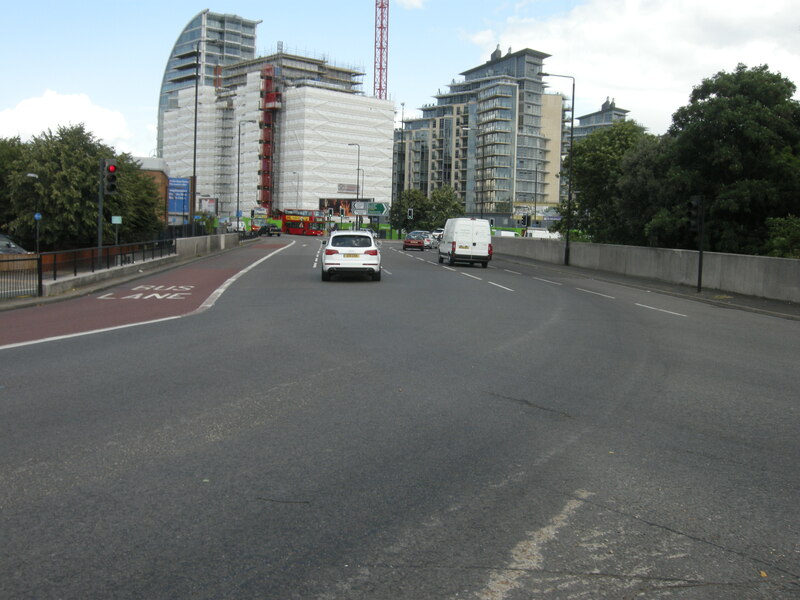 Conversely, it’s often very hard to allocate space in this way if you are intent on unwinding a gyratory for all modes. Believe it or not, this is another extensive one-way system, in the centre of Amsterdam – but one for motor vehicles only. Motor vehicles can only travel away from us (indicated by the small blue arrow towards the right of the photograph). 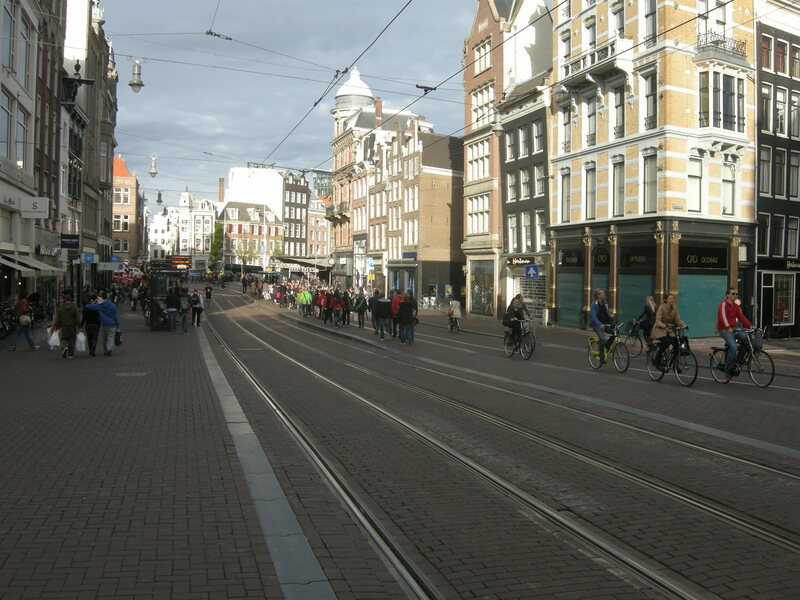 The rest of the space is for pedestrians, a two-way tram route, and two-way cycling. Would you want to dismantle this and install two-way running for motor vehicles? I hope not. A similar example, further out into the suburbs of Amsterdam. 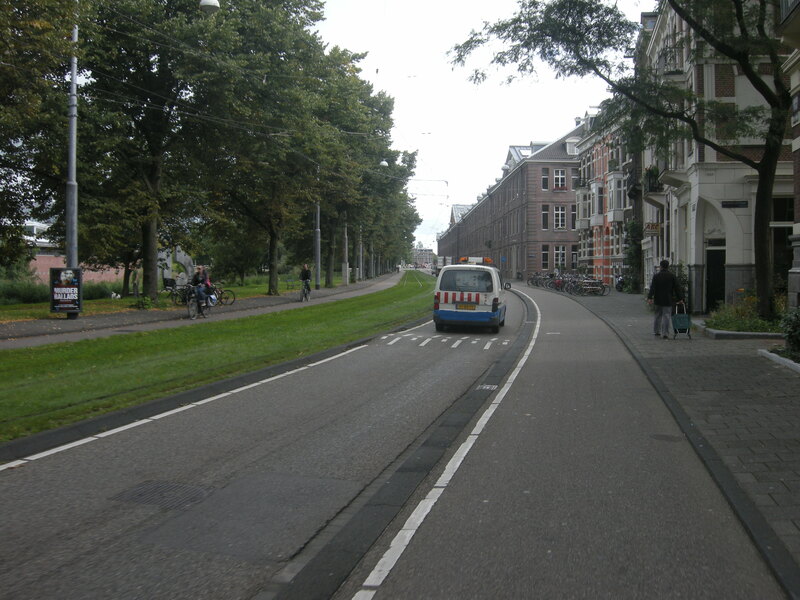 The van is driving around a one-way system, while bicycles can travel in both directions, on cycle tracks. The grassy area is a two-way tram route. Again, this allocation of space would not be possible with two-way flow for motor vehicles. 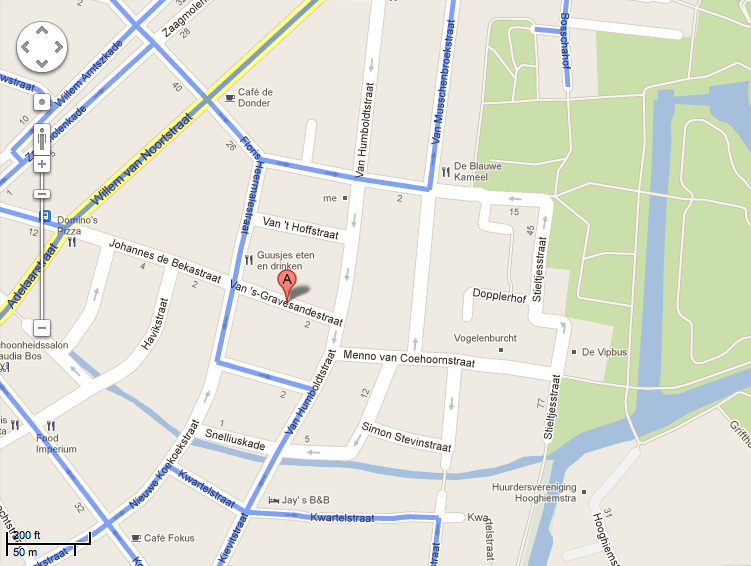 Finally, here’s a video of a one-way street in Groningen. The cars are flowing on a one-way system all of their own, while bicycles can travel in all directions. These are private gyratories for motor vehicles, created to allow safe, comfortable bicycle travel in all directions. You would not be able to allocate this amount of space to cycling (and walking) if this road had two-way running for motor vehicles. So, before we start dismantling our own gyratories and one-way systems, and restoring them to two-way running, perhaps we should think more creatively about how we can use the space that they occupy. Why would you restore a road like this in Kings Cross to two-way running for motor vehicles, when you could use the space far more effectively for two-way public transport and cycling? 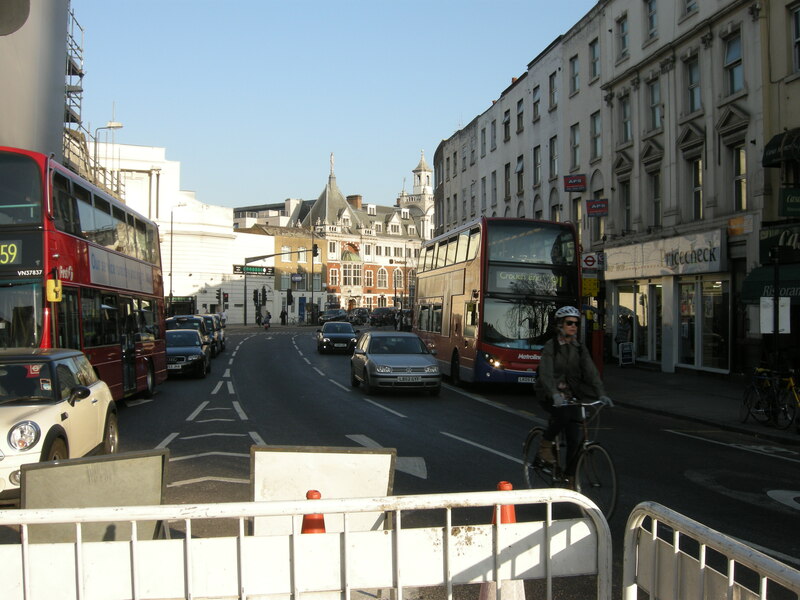 The emerging competition for space between bus lanes and cycle tracks in London can be greatly reduced if we keep one-way running for motor vehicles, and indeed if we introduce gyratories and one-way systems of this particular form in other places across the city. Let’s not consign them to the dustbin just yet. 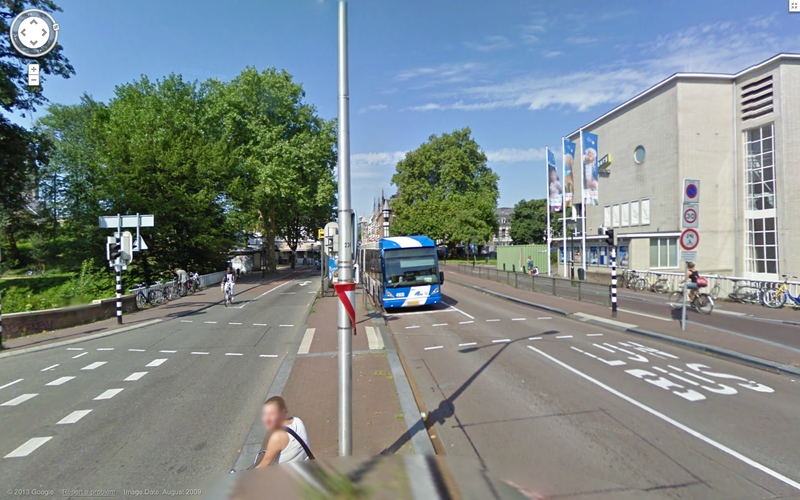 This entry was posted in Bus lanes, Go Dutch, Gyratories, Infrastructure, LCC, London, One-way streets, Subjective safety, The Netherlands, Town planning, Transport for London. Bookmark the permalink. On chaotic roads like those shown above, it actually makes sense to have two lane bicycle lanes set up such that the bicycle lane nearest to the traffic is for bikes travelling in the opposite direction of the traffic. This give cyclists a greater sense of safety as they can actually see what is approaching. Indeed, you see that arrangement on some one-way roads in the Netherlands: the with-flow cycling is segregated, the contraflow unsegregated. It is very sensible, recognising that danger for cyclists comes from vehicles coming up behind them more than from vehicles facing them. Indeed, your Piccadilly before/after shots make me feel sadness for the fact that the westbound traffic lane was not turned into a nice wide two way bicycle lane. What a missed opportunity! It even looks the part! 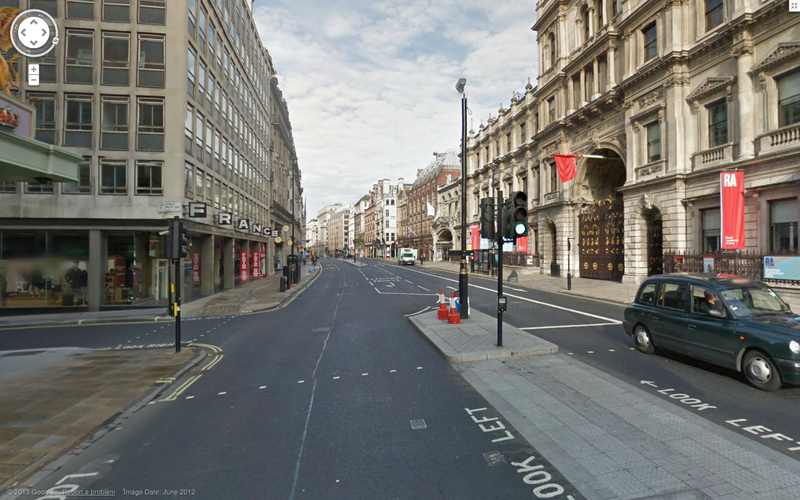 To be pedantic for a moment, was Piccadilly/Pall Mall ever a Gyratory? Aldgate is a gyratory, as is old Street, or St Martin’s le Grand near St Pauls. Or around Kings Cross – kinda like a roundabout on steroids where it is envisaged that people may go around three quarters of a circle or more. It is certainly thee though that Piccadilly/Pall Mall was converted into a (mainly) one way system for the same reason as a gyratory – to maximise the throughput of motor traffic. Arguably, a gyratory/one way system might not be a bad thing, if its design principles are sound, ie NOT to facilitate motor traffic, but to deliver some other streetscape improvement, such as wider footways, pedestrianisation, or cycle tracks. For example, Godalming High Street, in Surrey, when it is not closed to traffic entirely at weekends, is one-way and semi-pedestrianised. Before that, it was hell on earth. Apart from facilititating more or faster traffic, rendering a street one-way might have other purposes. 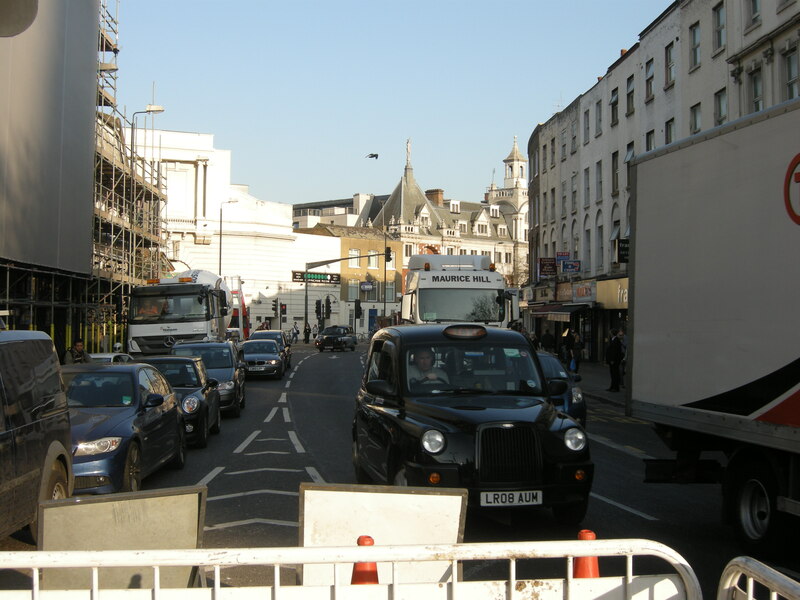 In the heart of the City of London, for example, there are streets such as Ironmonger Lane which are simply too narrow for two vehicles to pass – even if there were no footways. Such streets could in principle have cycle contraflow, although by no means all of them have yet been converted, notwithstanding the City’s accelerating programme of permeability measures. In the heart of the City of Westminster, on the other hand, throughout the Covent Garden, Soho, and Mayfair areas, many minor streets have been ,made one-way for an altogether worse reason – car parking. They are wide enough for two cars, but not much more than that, so one-ways permit half the road width to be dedicated to car parking. Trouble is, as we all know, car parking creates car traffic, which creates congestion, pollution, and road danger. So – and you could be waiting a long time for this to happen – what we now want to see across Westminster is that all those one-ways which make it so impossible to navigate across on a bicycle, are rendered two-way for bikes only, by converting the parking bays into a cycle track. Good post. I’ve spent a good deal of time in Utrecht, I lived there throughout the 90’s and still go back and visit every year and it would be fair to say you avoid as much as possible driving in the centre of Utrecht. If you drive into Utrecht, you find a carpark and complete your journey on foot or get a bus, it’s normally not far and the buses are very very reliable and go just about everywhere. They run a brilliant park and ride right on the outskirts where 5 people (a car full) get unlimited public transport and parking all day for a couple of Euros. Compare that to park and ride in Cambridge where you pay £2.50 each and for just the one return journey on the bus. Park and ride here is not cost effective if you had 5 people in your car, it would be cheaper to park in the centre. The city environment in Utrecht is fantastic, it’s very busy and buzzing but other than the odd car, buses and taxi’s everyone else is walking or cycling. My parents live in Holland and are well into their cars, as are alot of the dutch, but they know that this way of keeping the city car free is much better for everyone, you don’t get complaints from the 50% of dutch who aren’t so keen on cycling. They still have their 5 lane motorways and where they can drive it’s smooth, well maintained and you aren’t faced with on street parking, bad road lay out, random bad parking or cyclists and pedestrians trying to go about their day who happen to have to cross the road but there’s no crossing where it’s needed. If people are going to a concert, or shopping, or to meet friends, they know the best way for them to get to where they need to go and it invariably, if they drive, involves leaving their car in a car park and walking or getting the bus. Everyone will either get their unlimited bus transport with the parking or they have a ticket that’s valid for up to 20 journeys in their wallet which costs a few euros and you stamp each time when you get on a bus or tram, so you know how much your journey will cost, you know there’s a bus where you want to go and the cost is tiny compared to parking charges and bus fares we are used to here. Maybe it’s subsidised but they make the money back in having a vibrant and well accessed city centre, healthy people need less doctors and less accidents mean less expensive emergency services. Very interesting. Better arrangements for cyclists would make the idea a lot more accessible for newbies like me! Got me thinking about how I’d rearrange my area of South London now! Having a two-way protected cycle track on a one-way street works very well. There are two in downtown Vancouver. They’re a few years old now and after the initial adjustment and a bit of controversy have now become part of the landscape of downtown and everyone still seems to get to where they need to go. When they first went in a few people were thinking that it was odd to have a two-way track on a one-way street. I told them that it takes up less space that way as the other direction doubles as the “passing lane”. If it was one-way it would still need to be the same width. For any new kind of infrastructure, all you need is one example for people to get used to and then they can chill out and not freak out when another one is proposed later. They all know the sky didn’t fall with the first one.